Posted by admin in activity reports, Bagana, Caribbean, Dukono, Ecuador, eruptions, Guatemala, Hawaii, Indonesia, Italy, Japan, Kamchatka, Karymsky, Kilauea, Kirishima, Kliuchevskoi, Pacaya, Papua New Guinea, Russia, Sakura-jima, Shiveluch, Soufrière Hills, Stromboli, Tungurahua, Ulawun, United States, Weekly Volcanic Activity Reports. 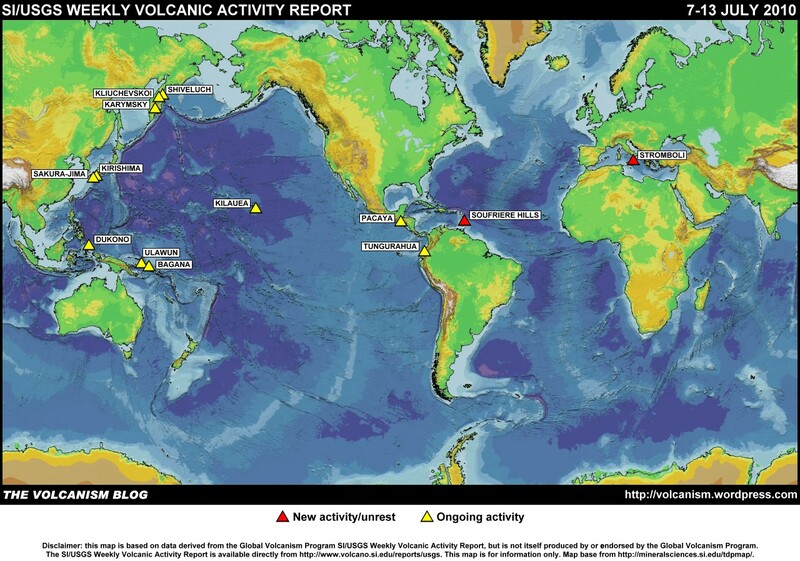 The Smithsonian Institution/United States Geological Survey Weekly Volcanic Activity Report for 7-13 July 2010 is now available on the Global Volcanism Program website. The following is a summary and not a substitute for the full report. New activity/unrest: Soufrière Hills (Montserrat), Stromboli (Italy). 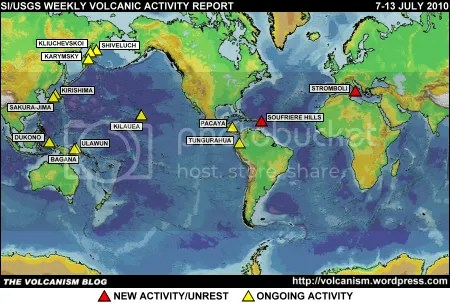 Ongoing activity: Bagana (Papua New Guinea), Dukono (Indonesia), Karymsky (Russia), Kilauea (Hawaii USA), Kirishima (Japan), Kliuchevskoi (Russia), Pacaya (Guatemala), Sakura-jima (Japan), Shiveluch (Russia), Tungurahua (Ecuador), Ulawun (Papua New Guinea). Soufrière Hills (Montserrat). MVO reported that small swarms of volcano-tectonic earthquakes on 23 and 25 June were coincident with ash venting beginning on 25 June. Ash venting diminished on 28 June. A second period of ash venting took place on 2 July and was preceded by two volcano-tectonic and two long-period earthquakes. An emission of ash, with accompanying rumbling noises, formed a plume that drifted WNW and caused ashfall in uninhabited areas of Gages, Plymouth, and the Foxes Bay region. During 2-9 July, roaring was often heard. The Hazard Level remained at 3. Stromboli (Italy). INGV-CT reported that two major explosions were detected by the seismic network, from the SW crater area on 25 June and from the NE crater area on 30 June. Poor weather conditions prevented visual observations using the web camera monitoring system. The event on 30 June was stronger, with several explosions occurring in a short time. Fallout from incandescent blocks triggered vegetation fires. Bagana (Papua New Guinea). Darwin VAAC reported, based on satellite imagery, that an ash plume rose to 2.4 km a.s.l. and drifted 75-150 km SW during 10-11 July. Dukono (Indonesia). Darwin VAAC reported that during 7 and 9-10 July ash plumes rose to 2.4 km a.s.l. and drifted 35-75 km NW and N.
Karymsky (Russia). KVERT reported that during 2-9 July seismic activity was above background levels and suggested that possible ash plumes rose to 2 km a.s.l. A thermal anomaly was detected in satellite imagery on most days; cloud cover occasionally prevented views of the volcano. On 7 July ash plumes drifted 20 km S. Tokyo VAAC reported that on 13 July an ash plume rose to 2.7 km a.s.l. and drifted W. The Aviation Colour Code level remained at Orange. Kilauea (Hawaii, USA). During 7-13 July HVO reported that activity continued from the summit and the east rift zone. At the summit the level of a lava-pool surface in the deep pit within the floor of Halema’uma’u crater remained mostly stable; glow from the vent was also visible at night. A plume from the vent mainly drifted SW dropping small amounts of tephra downwind. At the east rift zone lava flows that broke out of the TEB lava-tube system built up a number of rootless shields between 580 and 395 m elevation. Thermal anomalies detected in satellite images and visual observations showed that minor lava flows originating from the shields traveled as far down as 60 m elevation near the base of the pali on 11 July. Kirishima (Japan). Tokyo VAAC reported that an eruption on 10 July produced a plume that rose to 1.8 km a.s.l. Kliuchevskoi (Russia). KVERT reported that during 2-9 July seismic activity was above background levels. Satellite imagery analysis showed a large daily thermal anomaly over the volcano and a gas-and-steam plume that drifted 76 km S on 2 July. Ash plumes occasionally rose to 5.3 km a.s.l. and gas-and-steam activity was seen during 2-4 July. According to a news article lava flowed from a fissure during 8-9 July. The Aviation Colour Code level remained at Orange. Pacaya (Guatemala). INSIVUMEH reported that on 7 and 9 July white plumes rose from MacKenney cone and drifted N. Small explosions were detected by the seismic network on 7 July. An explosion on 13 July generated an ash plume that rose 300 m above the crater and drifted SW. Ash and tephra fell in nearby areas, and 150 people were evacuated. Sakura-jima (Japan). Tokyo VAAC reported that on 7 and 9 July ash plumes rose to 1.8-2.7 km a.s.l. and drifted SE and NE. Explosions were reported during 11-13 July. Shiveluch (Russia). KVERT reported that during 2-9 July seismic activity was above background levels and suggested that on most days possible ash plumes rose to 7 km a.s.l. On 5 July ash plumes from hot avalanches rose to 4 km a.s.l. and strong fumarolic activity was noted. Ashfall was observed around the volcano. Satellite imagery showed a large daily thermal anomaly over the lava dome and an ash plume that drifted 20 km S on 7 July. Tokyo VAAC reported that satellite imagery analyses indicated a possible eruption on 10 July. The Aviation Colour Code level remained at Orange. Tungurahua (Ecuador). Bad weather often prevented observations of the summit area during 7-13 July. On 7 July steam-and-ash plumes rose to 6 km a.s.l. and drifted WSW. The next day explosions were accompanied by acoustic waves. A steam plume rose to 8 km a.s.l. and drifted NW. Ashfall was reported in Cusúa about 8 km downwind. Incandescence from the crater was seen during both nights. Ash-and-steam plumes were seen on 9 July. Ashfall was reported in a few areas 8 km SW and W. On 10 and 12 July plumes with low ash content drifted W. Ashfall was reported 7-8 km to the W and NNW on 12 July. Incandescent blocks descended the flanks at night to 500 m below the crater on 9 and 12 July. Ulawun (Papua New Guinea). White-to-grey plumes rose to under 500 m during 27 June-9 July and fine ash fell in areas to the SW, W and NW. Occasional roaring noises were heard on 28 June and during 5-6 July. A slight increase in seismicity (above moderate levels) indicated by overlapping tremors and Real-time Seismic-Amplitude Measurement (RSAM) values was noted during 5-8 July. The foregoing is a summary of the Smithsonian Institution/United States Geological Survey Weekly Volcanic Activity Report covering 7-13 July 2010. It is provided for information only, and is based on but not a substitute for the full report, which comes with its own criteria and disclaimers. The map base is derived from the Smithsonian Institution/USGS/US Naval Research Laboratory This Dynamic Planet website. All the best to you and your family, Dr. H.